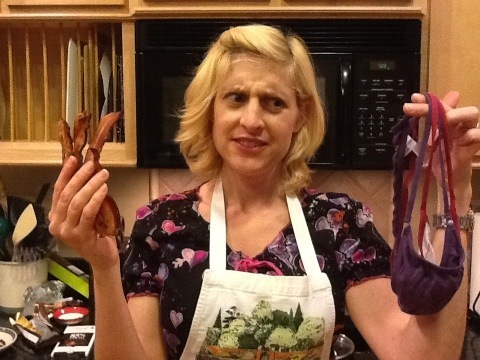 Dora was the one who requested chocolate covered bacon, which should come as no surprise to anyone who knows her. She’s a huge fan of Mo’s milk chocolate bacon bar. We were disappointed with the chocolate covered bacon at the Wisconsin State Fair, but it was covered with too thick a layer of an inferior milk chocolate (the deep-fried butter was amazing, though). 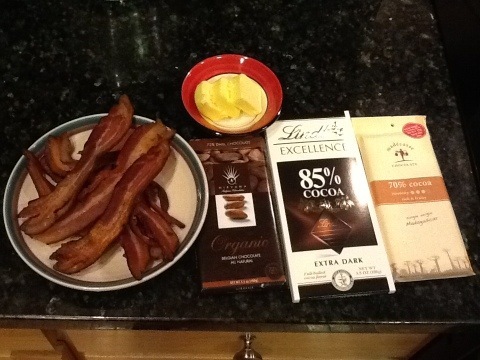 I was open-minded to trying dark chocolate covered bacon, and I found a Paleo-friendly recipe. The sweet, smoky and salty flavors complement each other well. I think I would have liked it even better with a darker chocolate, but Dora prefers about 70%. The ingredients. I ended up not using the 85% bar. We had more than enough chocolate. 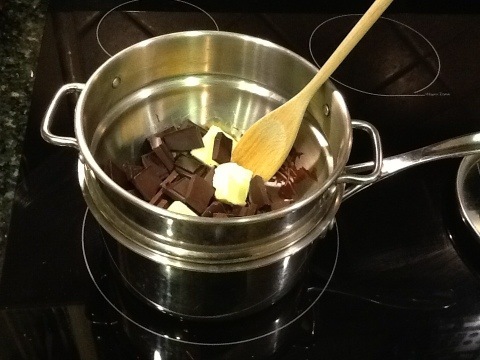 The best way to melt chocolate and butter without burning it is to use a double-boiler. See - you NEED one! 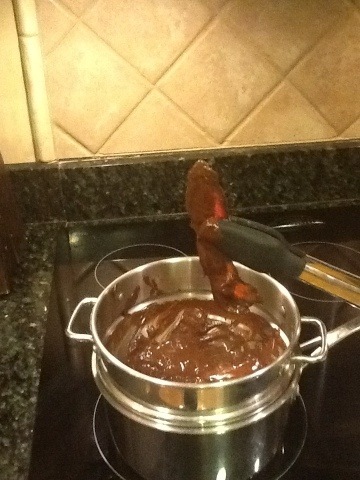 I decided tongs would work better. Special thanks to Jewel for taking the pictures for this blog entry. The finished product. 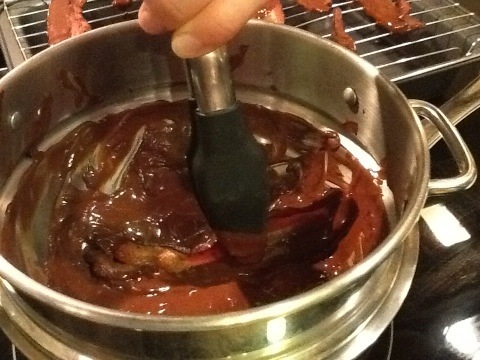 I also indulged in a glass of red wine to complement the sweet and smoky flavors. This really isn’t feasible in January. I’m looking forward to exploring local options in the spring. I did find the local harvest website, which is a national site that does include information for the Huntsville area. This rainy weather doesn’t agree with my back. I have to prioritize being able to make it through a day of work over getting exercise. Comments: I am enjoying spending more time with my family. Jen, your photography has improved exponentially! Looks great. Thongs, really? Jewel did a great job. I’ve been using the iPad to take most of the pictures lately. As long as I can get enough light in the room the pictures are clear with good color. 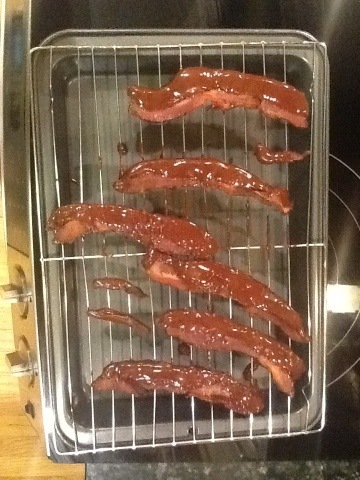 Tying the thongs around the bacon to dip it in the chocolate just looked awkward! It was delicious! We’ll see if my little bacon eater claims the rest for breakfast this morning.